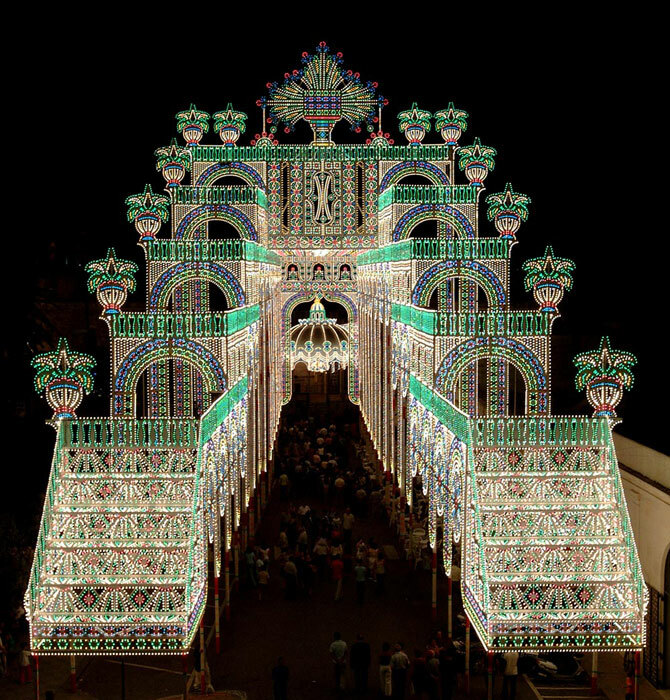 Not only bands, processions and fireworks for the streets in celebration… in Puglia the illuminated decorations play an important role. 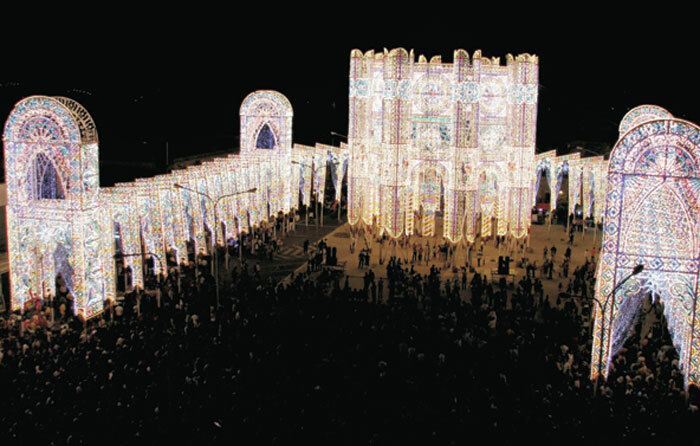 Here the art of lighting is the protagonist twice over: for the beauty of the illuminated public squares and because the companies that make this show possible are from Puglia itself. Many of these companies work in Italy and some work abroad as well, a number with more than a century of experience behind them. 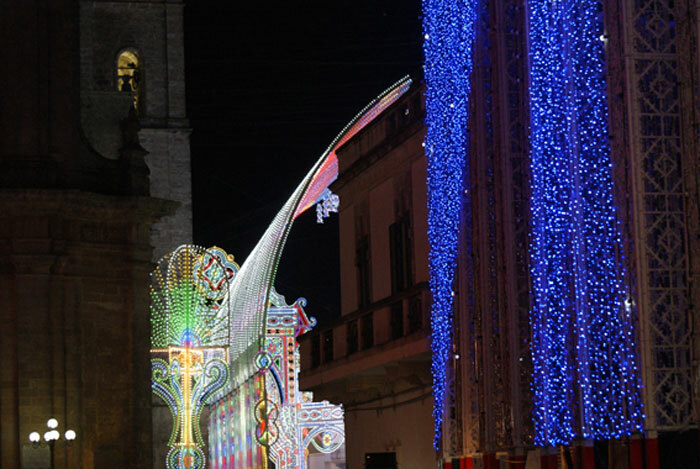 A mix of tradition and innovation, a skill composed of technological materials and handicraft systems. Someone remembers with emotion the times when the choreographies were composed of oil candles. Afterwards came the gas acetylene lighting system followed by the many small light bulbs, development which culminated in the modern laser and led techniques. 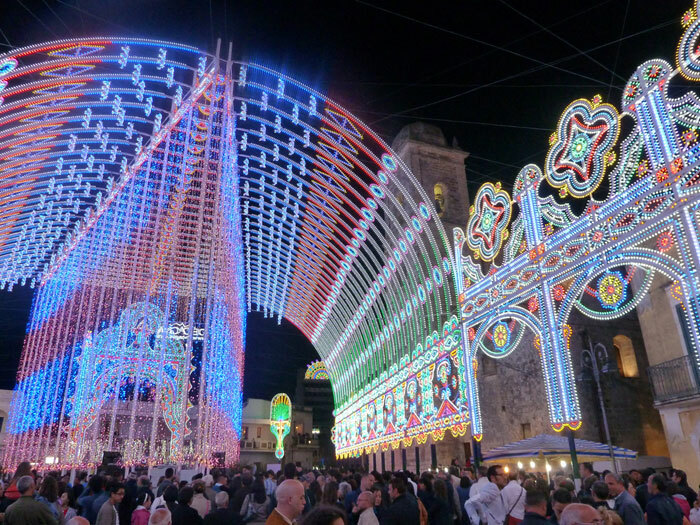 Only the talent, the creativity and the passion for this art have allowed these enterprises to make an important name for themselves all over the world, exporting this authentic “made in Puglia”. 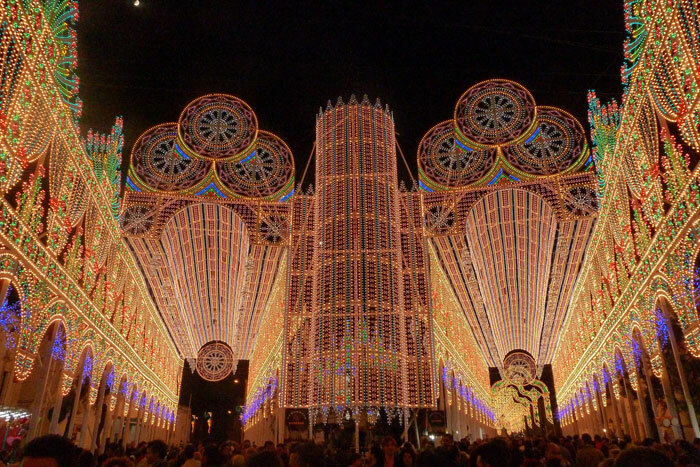 These straight structures, illuminated by coloured lights, have their roots in the Roman tradition and over time have been transformed in their shape, the colours and the materials according to the cultures with which they have come into contact and following the technical progress. Oil candles were added to the designs of the arches and the wood structures that, subsequently, became petrol and then electrical light bulbs. 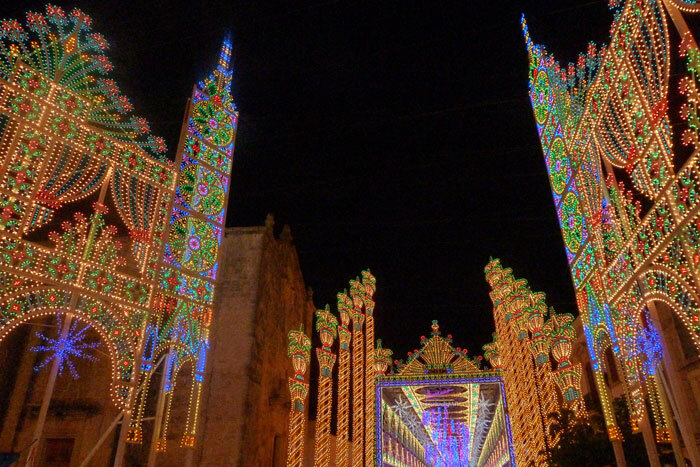 The “Luminarie” reproduce designs connected to religious motifs, facades of churches and typical decorative elements present inside the sacred buildings. Later they began to unite layouts and colours similar to carpets of an obviously Arabic note Today other materials have joined the wood, the led and laser technology has been used with the lights and the start up has been enriched with light, music and fireworks united by an intermittent rhythm. Tradition, however, reigns sovereign leaving the handicraft nature intact that finds its maximum expression in frames that reach thirty meters in height without a nail, a bolt or a screw, but held together entirely by iron wire and a weight unloading system that brings to mind the construction models sometimes in stone. 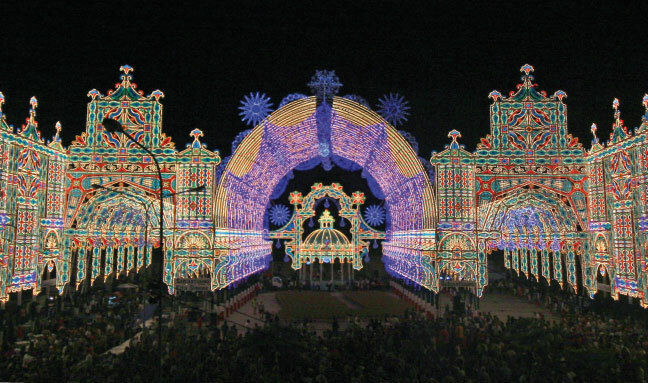 The “Luminarie” are from Southern Italy, but find an inspiring form in Scorrano with the three local companies, heirs to an ancient history, that transport this expression of Italian beauty all over the world.